This economical one pot dish is a perfect way to use the tasty meat from a hock bone. 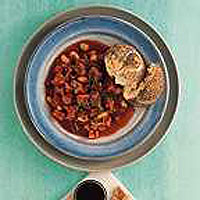 Canned beans save cooking time, but dried beans could be used if you have time to soak and pre-cook them. Serve with crusty bread for a warming supper or lunchtime dish on a cold day. Ham knuckles are available from the Delicatessen service counter. Heat the oil in a large flameproof casserole. Add the onions and fry gently for 10 minutes or until soft. Stir in the mustard powder, treacle, tomatoes, stock, tomato purée, sugar and chilli. Bring to the boil then stir in the beans. Cover and simmer gently for 15 minutes. Cut the ham into 2cm cubes and add to the casserole. Cover and simmer for 15 more minutes. Season with salt and stir in the chopped parsley. Serve with crusty bread.